Quest Card Companion (QCC) Updated! After years of no new Killer Bunnies® products, in late 2017 a new booster was released, followed quickly by a second new booster in early 2018, and then a third new booster later in 2018. Our team of QCC Maintainers updated the QCC by integrating the unreleased Conquest Card Companion (CCC) and new booster decks, completely revising the structure, sourcing (with footnotes!) many of the rules clarifications, and worked to remove as many typos and other errors as humanly possible. After nearly a year of work, the QCC Maintainers present the updated Quest Card Companion (QCC). Sourced text and fan clarifications that are color-coded. Fan clarifications noted in red. Over 250 footnotes for clarifications. Complete rules from Bunny Bits, card texts, web site, and CTA clarifications. Start of Game sequence and decisions defined. End of Game sequence defined. Added Boosters (Conquest Blue, Conquest Yellow, Conquest Red, Conquest Violet, Fantastic, Caramel Swirl, Creature Feature, Pumpkin Spice). Expanded Card Type Action Table. Cards renamed to Zeta Zeta names. To improve readability card rules indicate card names with underlines rather than single quotes. Find the QCC on the Quest games page. Moving forward, the QCC will be dated for its release so you can more easily discern whether you have the most recent version or not. 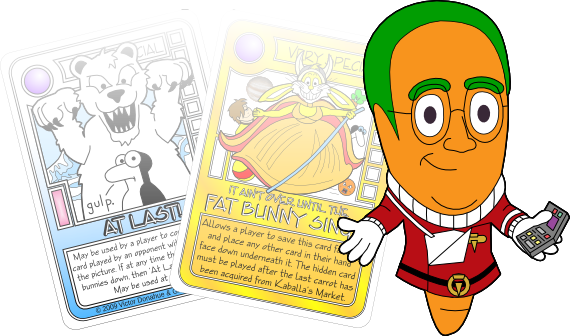 In early 2018, MagicCarrot.com inteviewed Jeff Bellinger and Jonathan Young of Creative Team Alpha, the creative force behind the Killer Bunnies® series of games. Read a transcript of the interview between MagicCarrot.com and Jeff Bellinger and Jonathan Young on the MagicCarrot Bunnies News page.